I have many fond memories till date of my first visit to the ‘Blue City’ of Jodhpur, which I took on an early, January wintry morning from Sarai Rohilla station, New Delhi. The trip was special for me in many ways – in fondly remember it as the trip happened on 26th January (Republic Day) and we were travelling together in a small group consisting of 2 small kids and 4 close friends. 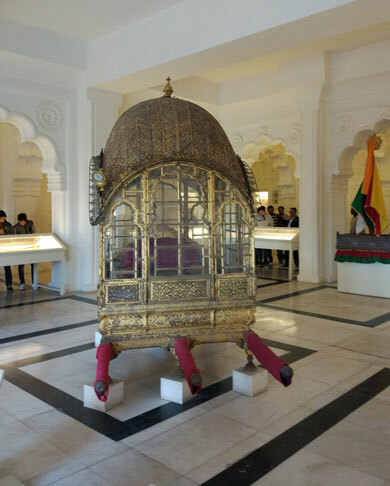 Rajasthan is one of those many places that continue to lure me even today with its historical extravagance and royal Rajasthani heritage. Its impregnable forts and beautiful palaces just never cease to excite me. So I was not a bit surprised when my eyes fell on the busy streets of Jodhpur that had an old Rajasthani traditional flavour and I was instantly in love with the whole city and its inhabitants. 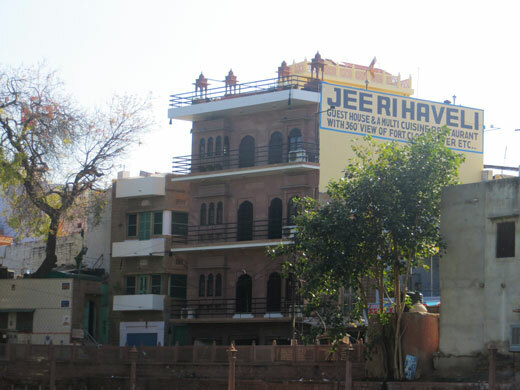 We had booked a room at Jeeri Haveli at Gulab Sagar, near Sadar Bazaar, which is indeed quite a good place to stay. 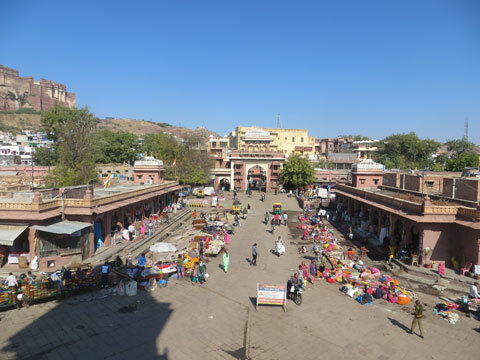 The Sadar market and its surrounding areas inside the walled city of Jodhpur, being centrally located is a favourite for tourists, both Indian and foreigners. Because it is an important tourist hub, you will also find many home stays and hotels and their beautifully decorated and brightly lit terrace restaurants. 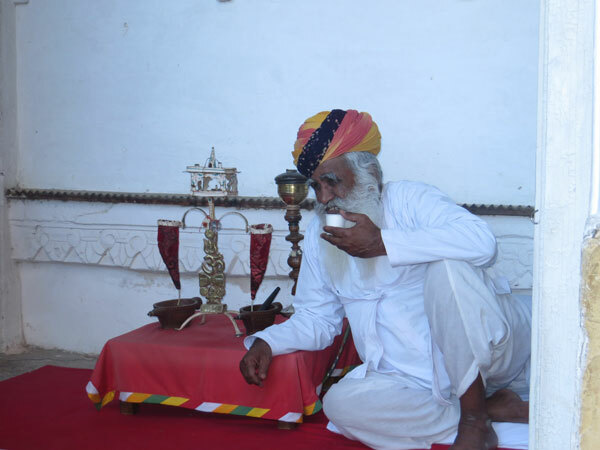 So you visit Jodhpur anytime, there would not be any dearth of hotels or home stays to put up. Since it was evening by the time we reached, we decided to go around exploring the place on foot. 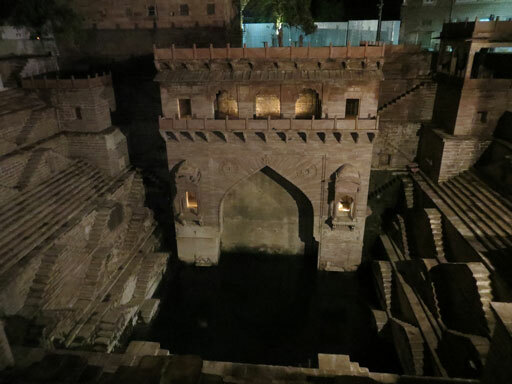 Walking through the narrow alleys of the walled city, amidst the architecturally rich old buildings, we first stopped by the Toorji ka Jhalara, an 18th century step well (or baoli). 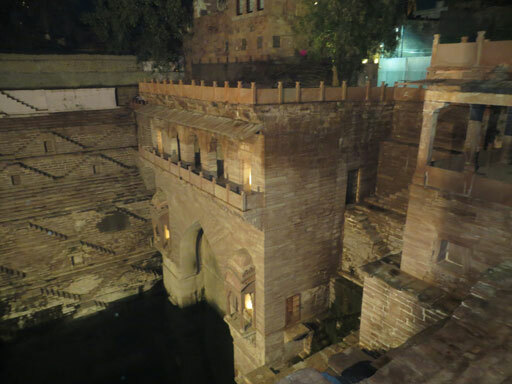 Built in the 1740s, by the queen consort of Maharaja Abhay Singh, the step well has been recently restored for tourists and one can go and spend a quiet evening sitting on its steps. 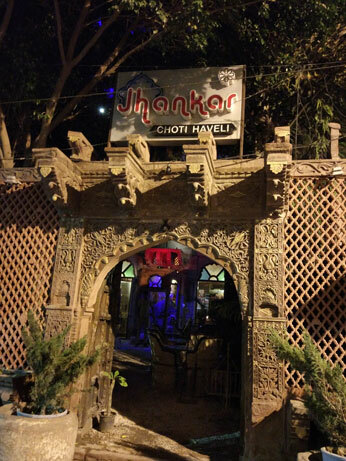 It was 10 by the time we were returning from the baoli to our hotel, and we stopped to have our dinner at a place called Jhankar Choti Haveli that served us traditional Rajasthani cuisine. The food was excellent and we all enjoyed the food to our heart’s content. We woke up to a bright, sunny morning the next day. I opened the window of my hotel room and I was greeted with a beautiful sight of the Gulaab Sagar Lake. 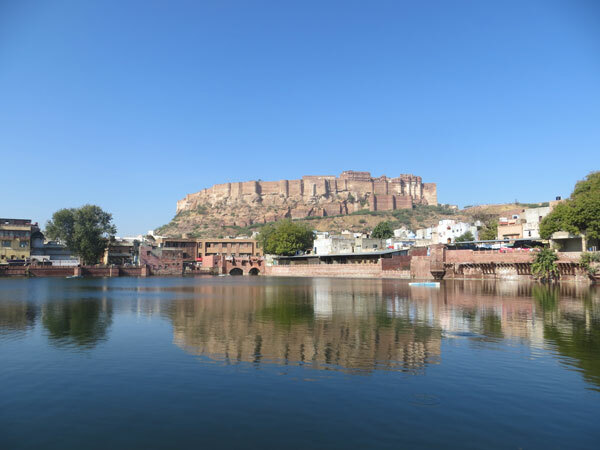 The lake is one of the many beautiful lakes of Jodhpur situated near the Sadar market. 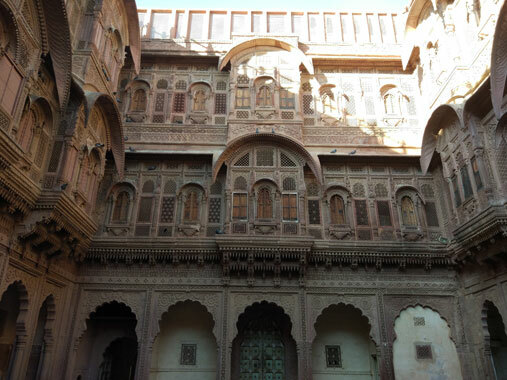 With the imposing structure of the Mehrangarh Fort in the backdrop, it presents a pleasant sight for anyone visiting the Sadar Bazaar neighbourhood for the first time. The lake takes its name from the mistress of Maharaja Vijay Singh, Gulab Rai, under whose supervision it was constructed way back in 1788. 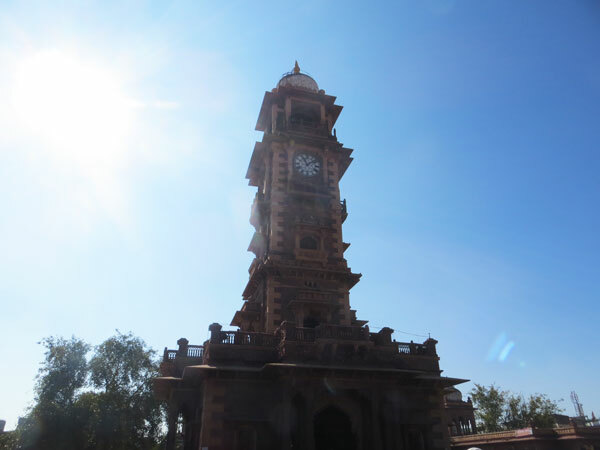 The Jodhpur Clock Tower (Ghanta Ghar) was located close by to our hotel and so we started off our day by visiting it. 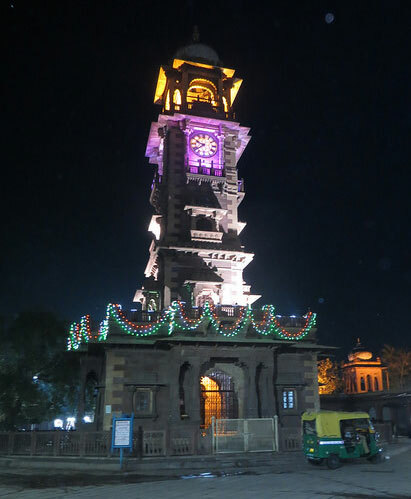 Built by Late Shri Sardar Singh in 1910, this incredible 3-storeyed landmark of Jodhpur stands tall at the heart of the Sadar (or Sardar) market. 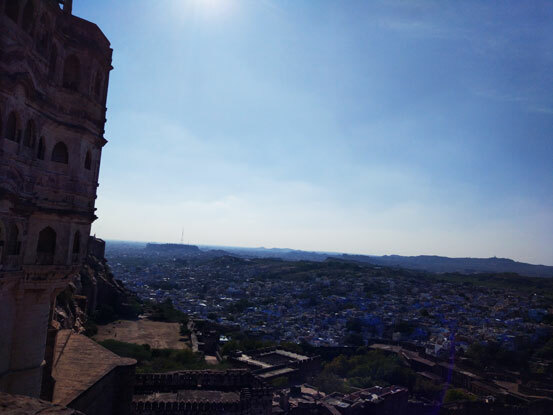 From atop you can have a view of the bustling market area around and also of the old walled city of Jodhpur. Go up another storey by walking the winding stairway and you will meet the people responsible for running the device inside the tower. If you are lucky enough to go on a Friday, you will find that the 3 heavy iron cylinders (indicating seconds, minutes and hours of a clock) are being pulled up with the use of a machine and with the passing of every single second, minute and hour, these weights keep coming down. The procedure of pulling these structures up is done every Friday. 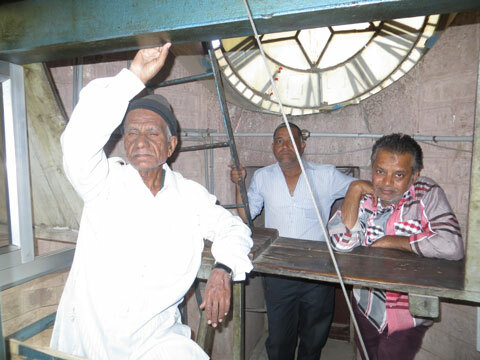 The time to visit the clock tower is between 10 AM to 9 PM and the entry Fee is Rs 10 each. The tower is beautifully illuminated at night, making this 100 ft structure look beautiful than ever. 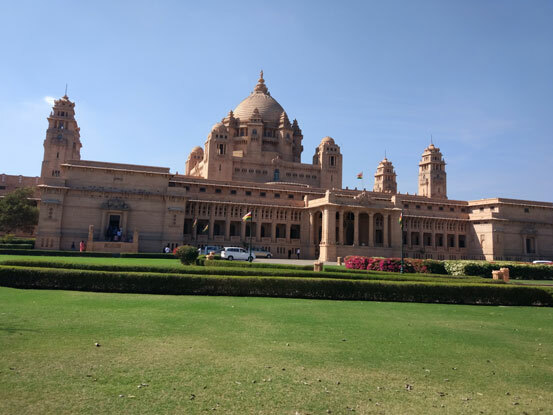 After checking out of the hotel, we went to visit the Umaid Bhawan Palace & Hotel, which is the official residence of the royal family of Jodhpur. Set atop a rocky but a barren hilltop, the view from above the palace that overlooks the entire Jodhpur city is quite breath-taking. 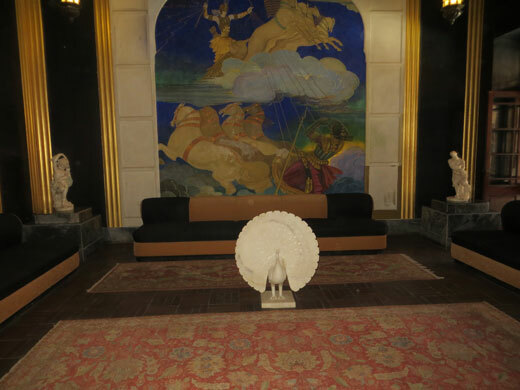 A major portion of the palace has now been converted into a hotel, while a part of it also houses a museum. 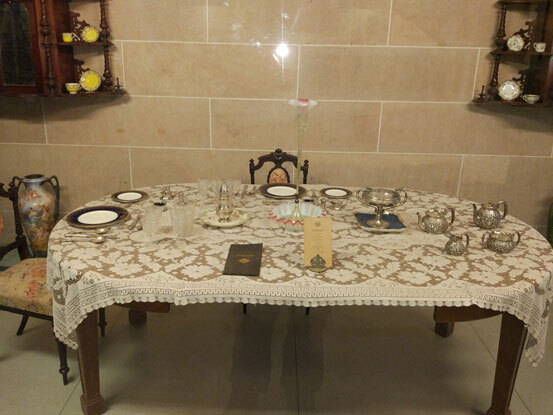 The museum is open to the public that has exhibits of priceless paintings, photographs of the royal family and a collection of household paraphernalia that at one point of time was used by the royal family. A wide collection of vintage cars belonging to the royal family is also on display in the garden area of the palace. 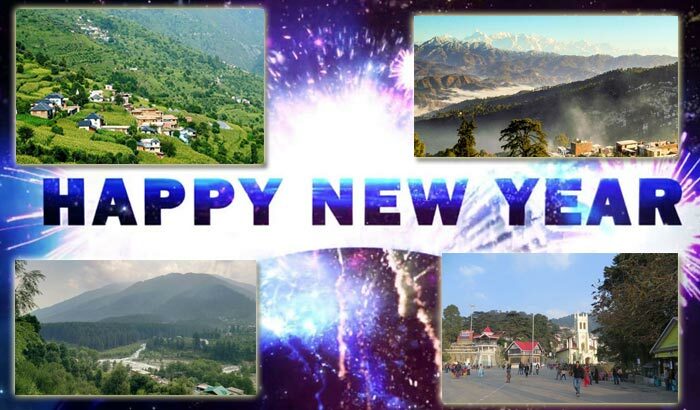 Like any other tourist place, the time for visitors is between 9AM to 5PM and the entry fee will cost a person Rs 30. 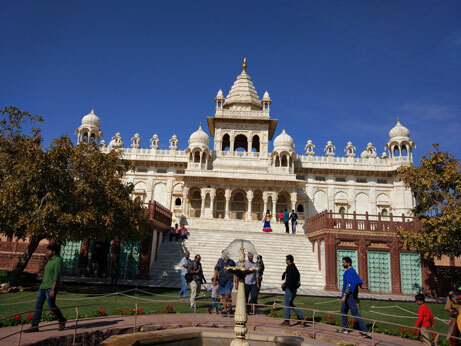 Our next stop was the Jaswant Thada, a rich Rajputana style of architectural delight made of fine white marble. 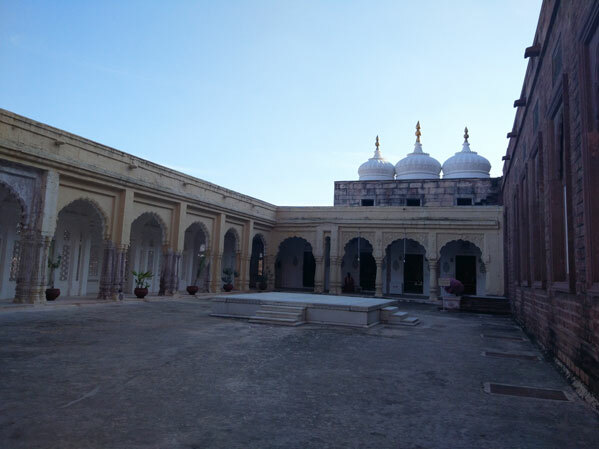 It is a mausoleum that serves as a cremation ground for the royal family of Marwar. 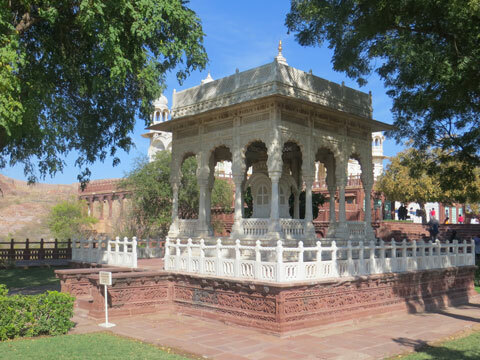 The main memorial is built in the style of a hindu temple and has on display portraits of the rulers and the Maharajahs of Jodhpur. 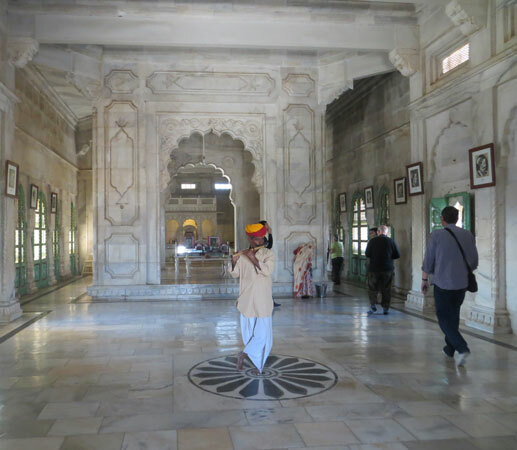 The Jaswant Thada complex is surrounded by a beautifully manicured multi-tiered gardens and intricately carved gazebos. The time to visit this place is from 9AM to 5PM and the entry fee is Rs 15 per person. 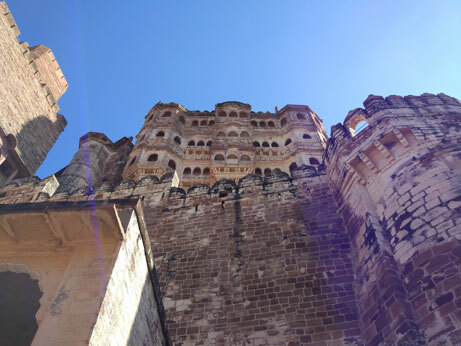 The Mehrangarh Fort, which was our last stop for the day is situated very close by to the Jaswant Thada. 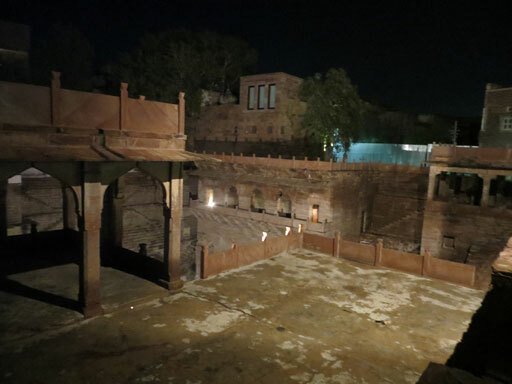 It is a fort museum that was built by Rao Jodha in the year 1460. 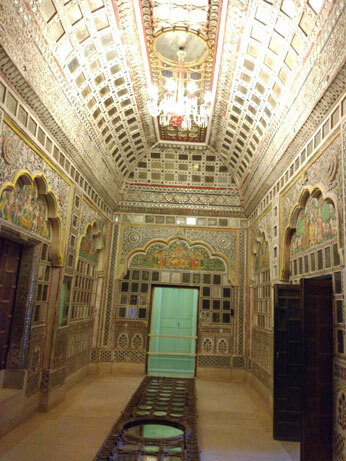 The fortified structure that towers above the Jodhpur skyline boasts of expansive courtyards, exquisitely crafted jharokhas (windows) and rooms and courts decorated with priceless gems and coloured stones, the most prominent ones being Sheesh Mahal, Phool Mahal and the Takht Singh Palace. 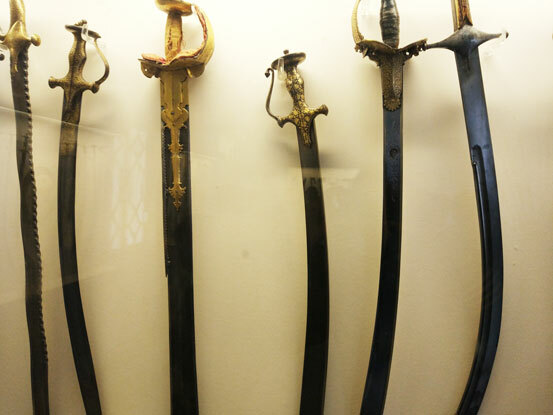 The galleries inside the museum has on display a large collection of treasures belonging to the Rajput rulers, that includes palanquins, elephant howdahs, armours, costumes and paintings. Visiting hours for the museum is from 9Am to 5PM. To go up to the museum, you will have to buy a ticket for Rs 40. Since we had kids with us and the climb up to the fort is slightly steep, we decided to take the elevator for which we had to pay another Rs 100 per person. From atop the palace roofs, the panoramic view of the blue city of Jodhpur below looks just as majestic as the magnificent fort itself. It takes almost 2 hours to go around the museum. We however chose to climb down the winding stone cobbled path on our way back from the fort. 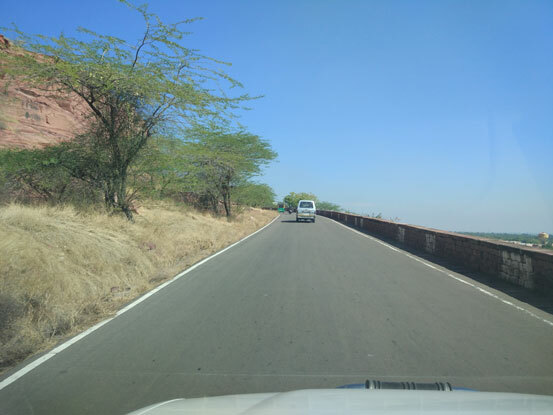 Next on our itinerary was to go to a desert camp some 100 kms away from the city, but as our 1 day trip to Jodhpur was coming to an end, I realized that bidding this city goodbye was as tough as seeing off someone special in your life. It was an experience worth remembering for a lifetime and I could only wish that my fate takes me to this city one more time and I would love that beyond wonder. 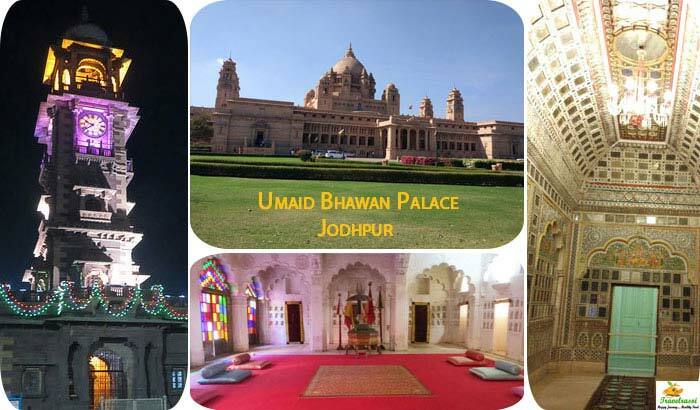 How to Reach: Jodhpur is well connected to all the major cities in India by road, rail and air. There is a railway station at Jodhpur that has trains running to all the major stations. 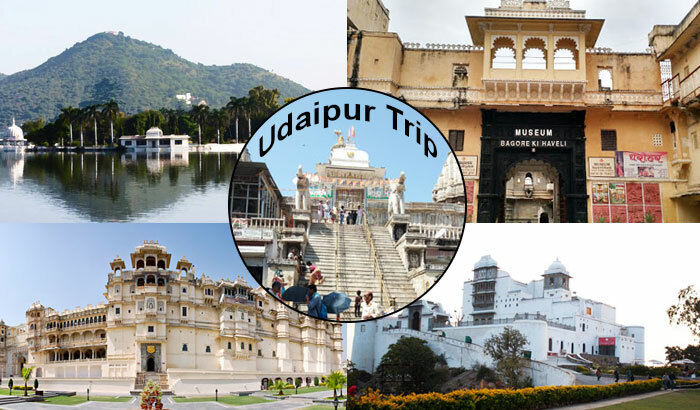 There is also an airport at Jodhpur, to which there are daily flights from Delhi, Mumbai, Bengaluru, Jaipur and Udaipur. 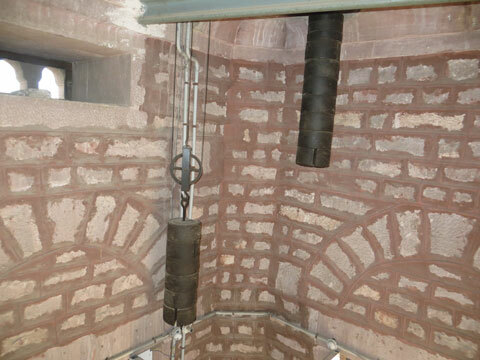 Best time to visit: The best time to visit Jodhpur is during September to March. Summer months are generally very hot and not many tourists prefer visiting it during April to August. Places to stay: There are abundance of hotels and home stays and searching for accommodation for 2-3 nights should not be a problem. But prior booking is mandatory if you want to be sure about getting a room during peak season. 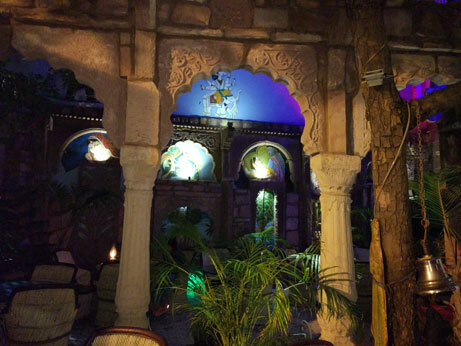 Where to shop: Sadar market is the perfect shopping destination in Jodhpur that is famous for spices and handicrafts. But please keep in mind that you might have to bargain before buying anything. 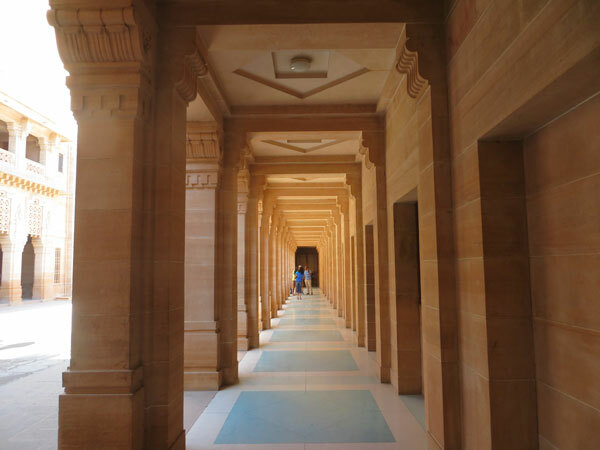 Share the post "Jodhpur – The ‘Blue City’ of Immaculate beauty and royal grandeur"